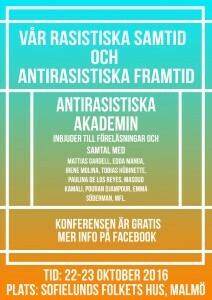 SAVE THE DATE 28th of May for our conference in Lund! This conference aims at exploring sites of structural, institutional and other forms of racism in academic life and developing strategies to dismantle sometimes blatant, other times more subtle and hidden, forms of discrimination and racism in academia. How can we teach in an anti-racist way? What does an anti-racist learning require? How might we create and sustain learning spaces in which we can explore difficult issues in critical ways? How does one become an anti-racist scholar? How do we engage with anti-racism in research and how can we write critical research applications that also are successful? How can anti-racism help us create more diverse curricula and reading lists? How can we identify and address the privilege that leads to “cloning cultures” in academia? What are the best strategies for creating an academia that reflects the diversity of society? These and other questions will be addressed during this full day of lectures, workshops, a panel and much more! The event venue and more content will be published soon on the Facebook event! 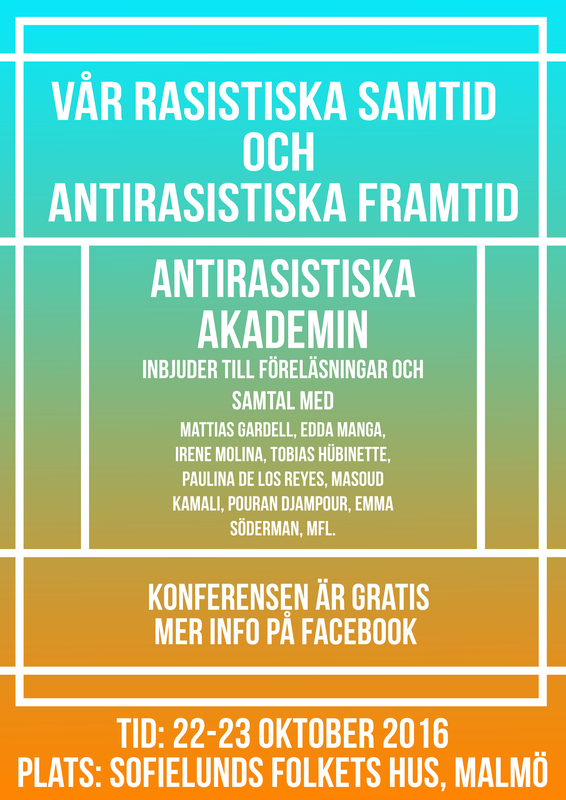 This is an invitation to the next meeting with ArA:s group ”How to Be(come) an Anti-Racist Scholar”. We will meet at Wednesday January 24, 10.30. The venue will be Malmö university, Niagara, room NI:B814. Only MAU-staff have access to this floor, but I will meet up anyone who needs to be let in at the reception on the ground floor.